I am not exactly sure when I became aware of W. Eugene Smith’s work on Pittsburgh, but once I saw it I was hooked. Part of it was the gritty B&W images that provided a look back into the industrial history of Pittsburgh and part was the connection I had to the city through my family. My parents were born in Aliquippa, a steel town on the banks of the Ohio River about 20 miles northwest of Pittsburgh. Even though I didn’t live there for any length of time while growing up, except for a couple of one-year periods when my dad was stationed overseas for the Marine Corps, we always made trips back to visit relatives. Living in South Carolina, our route to Aliquippa would take us through Pittsburgh. I was always fascinated by the scene when coming out of the Squirrel Hill tunnels. As we rounded a bend in the highway, the massive Jones and Laughlin (J&L) mill would loom in front of us, spewing smoke and steam with the city in the background. The highway passed very close to the mill, and the scene was spectacular. In my parents hometown of Aliquippa, J&L’s Aliquippa Works stretched for 7 miles along the west bank of the Ohio River. It was always amazing to see this monstrous industrial complex towering over us as we drove past on Route 51. If we were driving on the other side of the river at night and were lucky, sometimes we would see the whole area light up as slag, a waste product of steelmaking, was dumped on the hill overlooking the mill. The molten slag would look like lava as it poured down the hillside. In later years, it was discovered that slag could be used in high-performance concrete, such as the type used in the construction of bridges. By the time I discovered Smith’s photography of Pittsburgh, most of the mills had closed and been dismantled. Today, the J&L plant in Pittsburgh is a technology complex, and the Aliquippa works is mostly a brownfield spotted with a few small industrial businesses. Originally, I planned to go through Smith’s book and revisit some of the places he photographed and make contemporary images of those scenes. But as I visited and began to research the decline of the steel industry and the “rebirth” of the city, it became evident to me that the real story would be the towns surrounding Pittsburgh. Over the last 10 years, the media has reported extensively about how Pittsburgh is experiencing yet another renaissance. First, there was the industrial renaissance that began in 1875, when Andrew Carnegie began steel production at the Carnegie Steel Company in nearby Braddock. 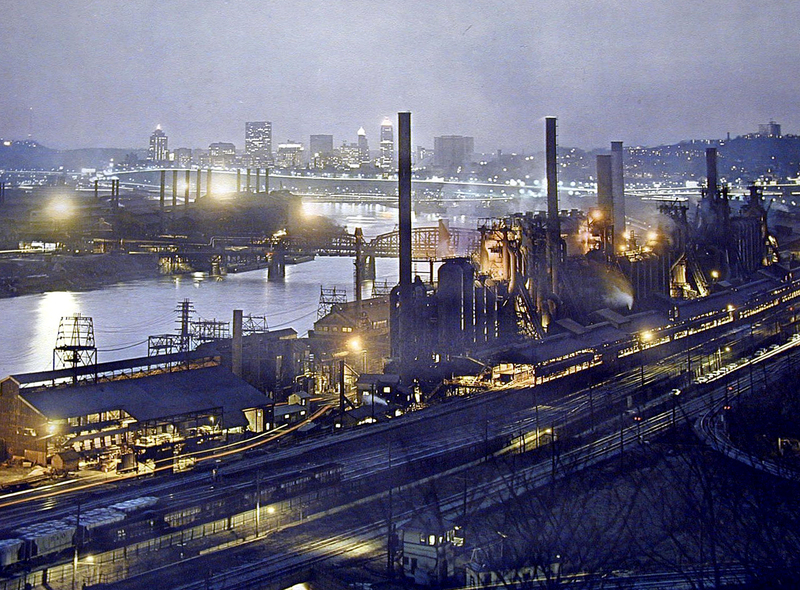 By 1910, with more mills in operation in the surrounding towns, including one just east of the city, the Pittsburgh region accounted for over a third of the steel production in the United States. During World War II, area mills operated 24 hours a day and produced almost 100 million tons of steel. But all of this industrial success came at a cost to the environment. Pittsburgh was recording extremely high levels of air pollution, and some days the sky was black with smoke and soot from the mills. That soot sometimes caused the city to keep streetlights on in mid-afternoon, and the city’s three rivers look like sludge. The city’s reputation was not helped when writer James Parton said in an 1868 issue of Atlantic Magazine that Pittsburgh was “Hell with the lid off.” In 1995, the Monongahela River Valley’s air was among the most polluted in the United States. After WWII, the city launched a clean air and civic revitalization project they again called the “Renaissance.” Then in 1977, they began “Renaissance II” to focus on cultural and neighborhood development. But in the early 1980s, the steel industry collapsed, resulting in massive layoffs and mill closures. People left by the thousands in search of work. In the late 1990s, the most recent renaissance began as the city shifted its economic base to education, tourism, healthcare, finance and robotics. 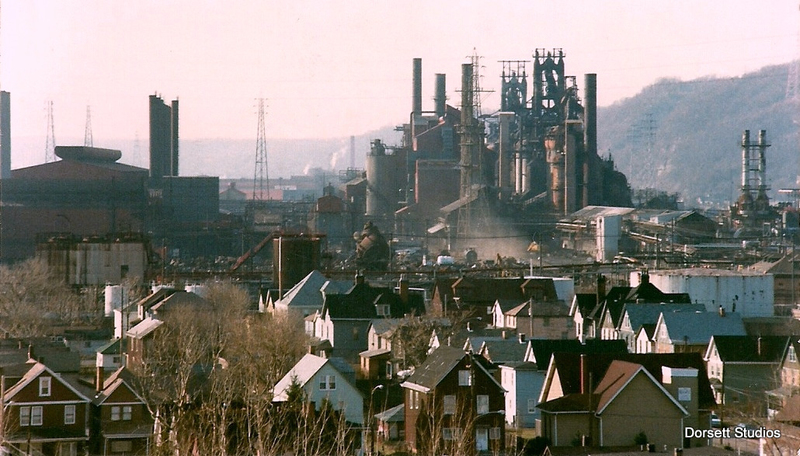 Today, Pittsburgh is touting its economic success, but while all this is good for the city of Pittsburgh, I could never reconcile this success with the deep economic depression that most of the former steel towns such as Aliquippa are continue to face. I vaguely remember Aliquippa back in the 1970s and have heard so many stories from my relatives about how vibrant the town was back then. Today it is a shell of its former self. The focus of this project will be to document these towns, showing their current economic state as well as the pride people living there have in their ethnic traditions and their blue-collar history as steel workers.